Previously to the launch of the Delta Recruit program, I had completed – as had thousands of others – the Defera episode titles more times than I can count. Most of us completed the episode run at least 1x per alt, and some a few more than that primarily for the rewards. Even more of us used the Defera Dailies as a quick route for dilithium when STF queues were slow, or we just wanted some solo PVE with a decent reward. When the Delta Recruit program showed up, it was time to do it all over again. But for some players – not all – we suddenly could no longer complete the Defera Dilithium portion of the mission. At various reproducible points in the map we would experience a sudden CTD (crash to desktop). Many players reported no problems, while other grew frustrated. Many – including myself – gave up on finishing our Delta Recruits. There is nothing more frustrating that hitting the same wall week after week. Some players reported simple solutions by not triggering certain events – in this case consoles. No luck there for me and others. But like clockwork, every Saturday morning I’d give it another try. Different weapons. Different computers. You could even say I bought a new computer in part to get past this glitch. I finally got past it this morning – and it’s reproducible. With my luck this is the result of a stealth fix introduced on Thursday. But on the off chance I actually found the problem – here’s how I worked it out. Failures could be seen consistently in the upper intestine hallway. Of the 11 attempts, 2 failed in the first passageway, 7 in the upper, and the last 2 crashing at the entrance to the lower intestine big room at the end. Repeated attempts to enter the big room is where I’d fail, whether I’d triggered consoles or not. So I started to wonder what had I changed on my alt and with my bridge officers that might have been the cause for this. I had been assuming the glitch was from something added during Delta Recruits patch. In this case, no recruit content had been added to this map or episode. Maybe it was my Boffs? So I set stand points for the officers in the main room away from combat, and ran the mission on my own. An almost success. Once the final boss appeared, I crashed. But my officers were standing close to where the boss beams in at the end. So I tried again – this time sending my Boffs to the far side of the room., near the force fields holding in the atmosphere. What had changed? I had run this mission too many times to recount, always with a full compliment of officers. Regardless of my alt, my ground team is almost always identical – 2 tacs, 1 sci, 1 engineer. What could they possibly be doing to trigger a crash? Intelligence Boff powers. That’s what was different. To confirm that this success I ran the mission again with non-intelligence powers, all boffs running with me. Success again. Did it a third time with intelligence boffs, CTD. I’m not sure why, or which Boff Intelligence ability may be causing this (2 Intel boffs, 16 possible single power variations, to many possible dual-ability interactions to test), but I’m fairly confident this issue is ground intel ability related. And on another note – passed 100 followers on Twitter this morning. I had the same problem but no INT boffs. It has something to do with triggering effects that involve screen shaking, especially underground. I noticed when I switched out grenades for something less screen-shaky, I CTD’ed less. Turning screen shake off did not seem to fix the problem, but I just discovered that option shows up separately in RPG and Shooter modes, so I may have “turned it back on” when switching modes. Unfortunately the Breen use grenades, and the seismic tremors also seemed to set it off–sometimes. I had it happen several times when disabling a device with no enemies around, so it’s definitely something beyond combat FX. Before the alleged fix, I would try to lay down AoE damage effects early so if I CTD’ed and logged back in there would be fewer enemies. 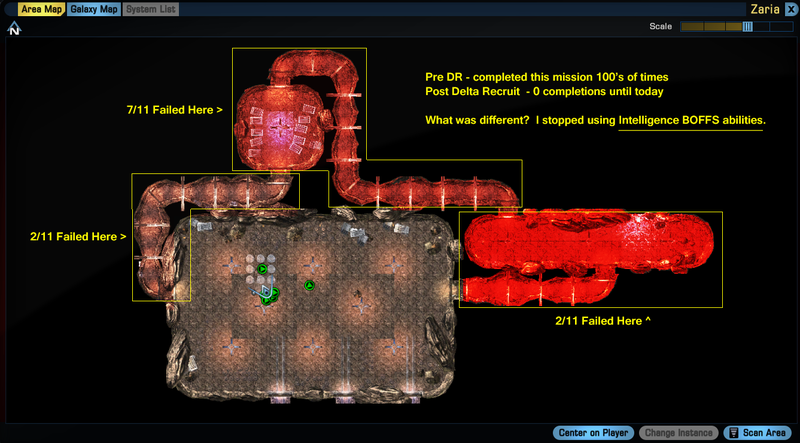 I crawled through the tunnels that way, CTD after CTD. Haven’t verified the fix yet. Have you? Next Next post: Data Mining – Some Things You Should Know About STEAM.